Just-Wiped is supposed to help you finding your servers as fast as possible. 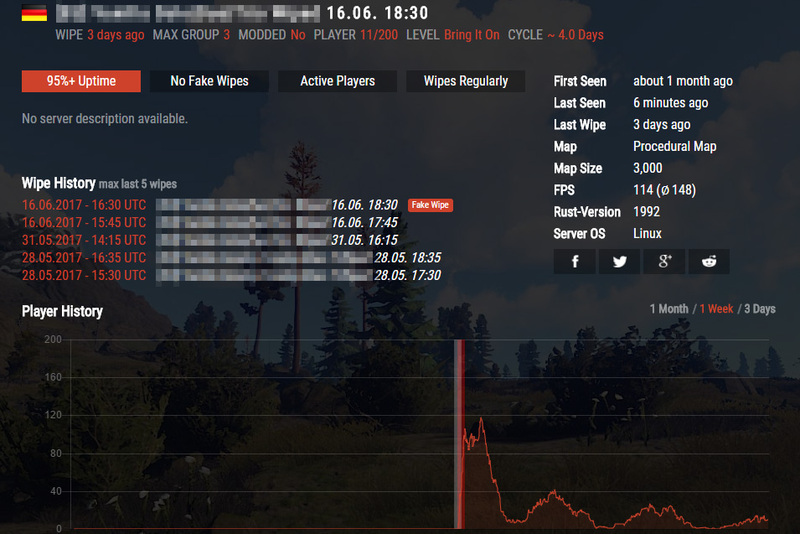 Having different countries, timezones and tons of ways adding dates to a server name indicating wipes, it is often a pain to quickly find what you are looking for. The service tries to figure out the correct server time and lists everything available in an ordered list, showing you the time, since the server has wiped. Besides listing Rust servers by there latest wipe, there are some other handy features for you. Just-Wiped not only provides an easy to use quick filter on the top right of the main page, but also has a extremely detailed extended search. You are now able to search for servers like you never have before. 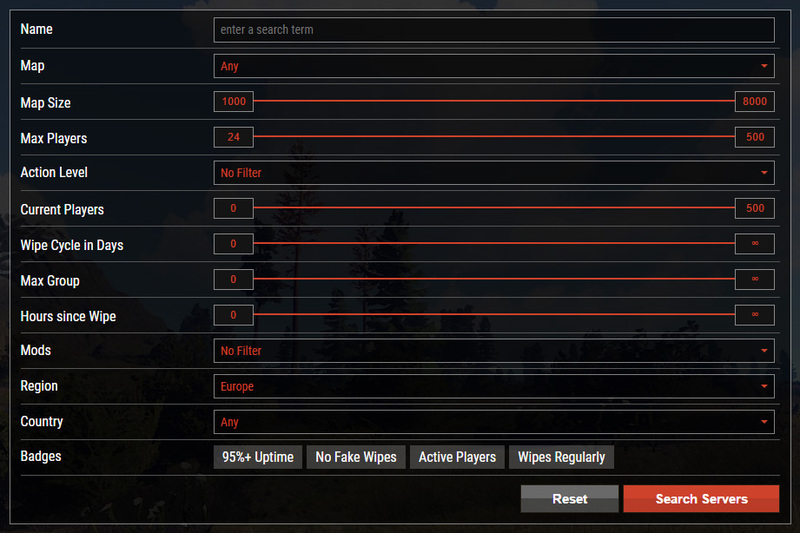 Set the range for map size or active players, define the time since wipes or filter by the approximated wipe length. On top of that you have various badge filters to find the best servers out there. You join a server that wiped 20 minutes ago and find bases build on a 2x2 foundation, 2 floors high, having sheet metal door and code lock. Sometimes it is possible and a lot of times admins rename servers. Fake wipes are a pain and you can now get rid of it. We detect fake wipes and mark those wipes, so you can easily identify them. Get a fair start on each server. You played one day, log back on and it is wiped. The server said weekly or on low pop. You never know, when they decide, that there is not enough population. 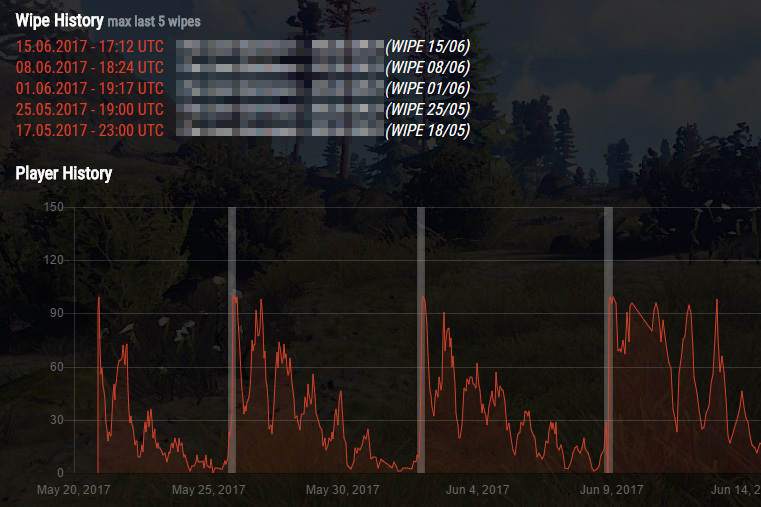 We log and tell you, what the actual wipe cycles are and how regular they appear. So you can now choose servers that wipe regularly and have the wipe cycle you are really looking for.